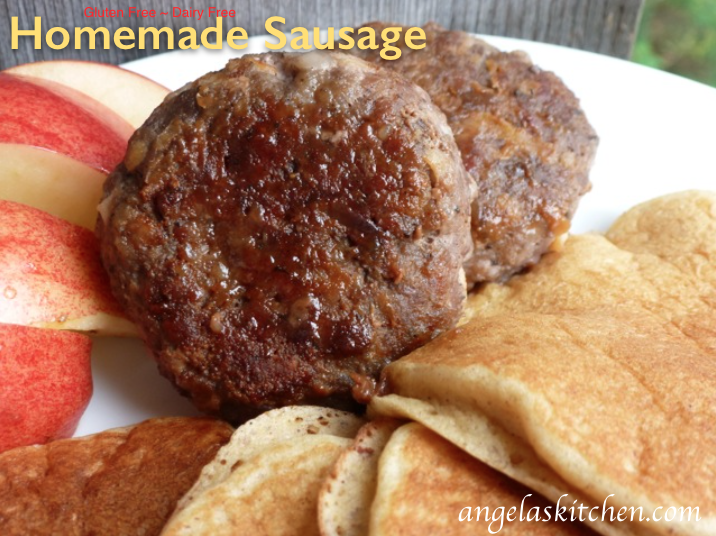 My family loves sausage, but I don’t like to serve them the additives that usually are part of the ingredients list. This is so easy to mix up and keep on hand in the freezer for cooking up for breakfast or to cook up to use as a pizza topping. In a bowl, mix all ingredients unto spices are evenly distributed throughout the pork. Divide pork and shade into 2 ounce patties. Cook over medium heat until browned and cooked through. To freeze: After divining pork and shaping into patties, place patties on a baking sheet lined with waxed paper, plastic wrap or baking parchment. Place into the coldest part of your freezer. Freeze until firm. Place frozen patties into a freezer container or bag separated by waxed paper. To serve: Thaw. Cook patties through until browned and cooked through. Angela’s Kitchen contains affiliate links throughout the site. If you choose to purchase items or services through these links, I will earn a small commission at no extra cost to you. Angela’s Kitchen is also a participant in the Amazon Services LLC Associates Program, an affiliate program designed to provide a means for us to earn fees by linking to Amazon.com and affiliated sites. These programs help reduce the costs of running this site. THANK YOU in advance for any clicks through!